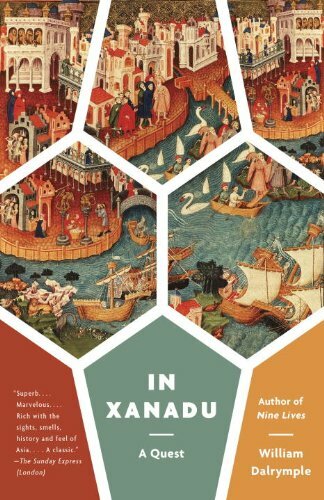 In Xanadu is a superb first travelogue by William Dalrymple, which describes his 1986 retracing of Marco Polo's 15-year journey from Jerusalem to Inner Mongolia in present day China. Dalrymple's amazingly ambitious journey via the Silk Road is a sheer delight to read and provides a wealth of historical information and no small amount of humour for us to enjoy along the way. Beginning in Jerusalem, Dalrymple gathers a phial of holy oil from the Holy Sepulchre as Marco Polo once did more than 700 years ago, before beginning his travels eastwards on a journey to Kubla Khan's summer palace Xanadu situated on the Inner Mongolian steppe. Dalrymple's previous summer holiday jaunt, walking from Edinburgh to Jerusalem following the route of the First Crusade, prepares him well for the daunting 12,000 mile journey, which due to current geopolitical situations, requires him to travel from Israel via Cyprus before picking up Polo's route again in Syria and then on through Turkey, Iran, Pakistan and thence onto China. En route Dalrymple visits and passes through a wide range of historically significant sites and cities and covers off a potpourri of histories' conquering empires including the Byzantines, Sassanians, Seljuks, Marmalukes, Ummayeds, Franks, Ottomans, Persians, Mongols, Hittites, Philistines, Saracens and Assyrians. His own travels also take him well off the beaten track such as when searching for carpet weavers in Kayseri and silk farms in Osku. This is a genuinely true rendition of Polo's journey, only missing part of the journey between Yazd in Iran to Tashkurgan in Western China as a result of being unable to travel through Afghanistan due to the ongoing war and minefields. By doing so, Dalrymple becomes one of the first tourists to travel the newly opened Karakoram Highway linking Pakistan and China and endures both mind and body-numbing conditions for significant portions of the journey. Interestingly, Dalrymple dismisses Polo's book The Travels as simply "a dry factual guide to commerce in the East, a book by a merchant for a merchant" which hardly is a ringing endorsement to read ourselves, but this doesn't prevent him from including passages of Polo's writings in In Xanadu. Included too are writings from other earlier travellers and historians on this most famous of routes, such as Usamah ibn-Munquid, Ibn Battuta, Thomas Coryat, Friar John of Pian de Carpini and Robert Byron. All of which evidences the depth of research Dalrymple undertakes when writing this book. When reading In Xanadu I couldn't get two things out of my mind during the entire length of the book. The first was that Dalrymple himself was only 22 when he first wrote In Xanadu. The quality of writing, knowledge of the region and his underlying confidence is truly astounding and was a portend for his future books. The second and more disturbing of the two, was Olivia Newton-John's 1980's pop song of the same. No matter that the words which kept tumbling incessantly through my head were wrong (yes, to my shame I did look up the lyrics! ), it was the insufferable tune that I couldn't get rid of. While In Xanadu will not be as revered as Polo's The Travels in 700 years time, Dalrymple has written an extremely good account of "a place where nobody dared to go, which they call Xanadu" (with apologies to Olivia Newton-John) and this is a book where you absolutely should go.